Salvation City, The Dog Stars: The best pandemic novels to absorb your Ebola panic. Can’t Get Enough Ebola Coverage? Read These Great Pandemic Novels. 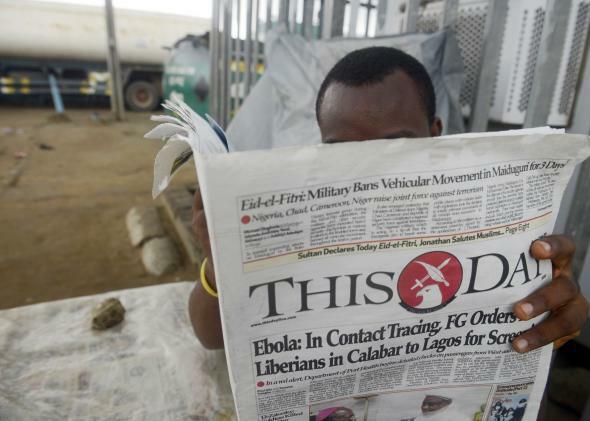 A man in Lagos reads a newspaper with a headline announcing government efforts to screen for Ebola on July 27, 2014. Unfortunately, Outbreak hasn’t aged terribly well. But if you enjoy scaring yourself with Ebola coverage, you should consider picking up some of these pandemic novels—which may make you want to bathe in hand sanitizer instead of saying “Bless you” the next time a passer-by sneezes in your direction. Flu-focused pandemic novels may be the scariest of all, because they feel the most realistic. The deadliest pandemic of all time, after all, was the 1918 Spanish flu. In Laura Kasischke’s In a Perfect World, a young stepmom is stranded with her charges, her husband stuck in Germany, as American health and order collapse. Peter Heller’s sparse The Dog Stars looks at an America nearly emptied out by the flu. And in Salvation City by Sigrid Nunez, a flu orphan is adopted by a religious family as society tries to rebuild. Geraldine Brooks’ excellent Year of Wonders: A Novel of the Plague, which is set in a 17th-century English village, will make you grateful for modern hygiene and communication. World War Z by Max Brooks, The Girl With All the Gifts by M.R. Carey, and I Am Legend by Richard Matheson all imagine contagions don’t just eat away at your brain—they make people eat brains. The Andromeda Strain, a classic by Michael Crichton, imagines that aliens aren’t just intelligent—they are crafty jerks. Margaret Atwood’s Oryx and Crake trilogy looks at a world depopulated by a vicious, Ebola-like disease created by a mad scientist, while the new viruses of Paolo Bacigalpui’s The Windup Girl are just some of many man-invented problems plaguing Earth. World-ending diseases don’t have to kill victims immediately. They can also stop humanity from bringing forth new life. In Children of Men by P.D. James, women can no longer get pregnant; in The Testament of Jessie Lamb by Jane Rogers, a new disease kills any woman who becomes pregnant. Birth control never seemed so important. But even if Ebola isn’t going to wrack the Western world, that doesn’t mean we should be flip about it. In a new piece for The New Yorker, Preston cautions, “People are wondering if the virus could spread to Europe or the United States, but the more immediate question is whether it could infect a whole lot more people in Africa.” Sometimes short-sighted self-interest is scarier than a plague—or a horror novel.